All planning authorities in England are required to prepare and publish a Local Plan. This sets out the policies against which planning applications for proposed new developments are assessed and decided. Normally this would have been the final round of public consultation prior to an Examination in Public of the Draft Local Plan, carried out by a planning inspector. In this instance, the nature and extent of responses into the 2017 version was such that substantial changes needed to be made. This work was carried out by OPDC planners in late 2017 and the first half of 2018. A ‘Second Regulation 19’ Draft Local Plan was published by OPDC on June 12th 2018, with a further round of public consultation which ran to July 30th 2018. The Forum made a further response to this third draft OONF response to Regulation 19.2 OPDC Local Plan. We again questioned the highly ambitious target of delivering 24,000 new homes at Old Oak, and the resultant extreme housing densities and building heights. This third version of the OPDC Draft Local Plan was submitted to the Secretary of State in October 2018. The document and all of its supporting material be found on the OPDC website at this link. The Old Oak Neighbourhood Forum, and other local bodies such as the Grand Union Alliance, St Quintin and Woodlands Neighbourhood Forum, and the Hammersmith Society continue to believe that the OPDC Draft Local Plan is not a sound basis for future regeneration and development in the area. There is much uncertainty as to whether the two ‘potential’ Overground stations at Old Oak Common Lane at at Hythe Road will ever be built, as no funding for these has been secured and Transport for London has major budget problems. Reliance on an improved bus network, on our already congested north-south routes, seems optimistic as a solution for a development of 24,000 ‘car-free’ new homes. 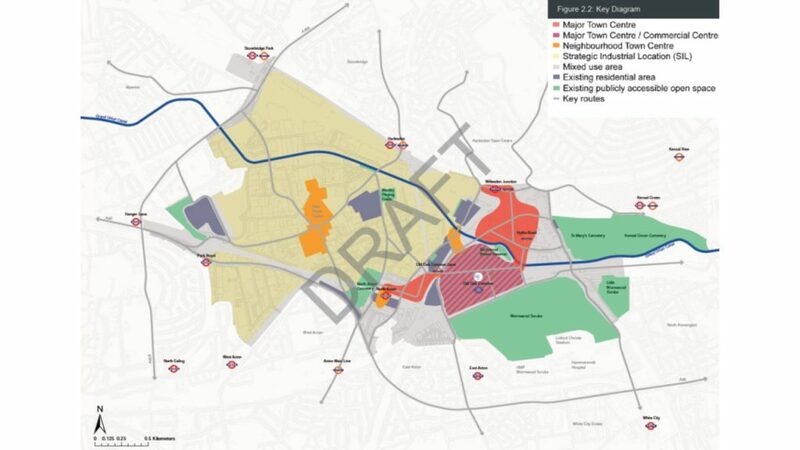 Latest proposals for ‘Old Oak North’ (the Cargiant land and Scrubs Lane) envisage this part of the OPDC area being built out at an average density of 600 housing units per hectare. This density figure has risen in each of the three iterations of the Local Plan, and is well above the 405 unit figure recommended in the current London Plan for the most well connected and ‘central’ sites. Unlike in earlier versions of the Draft Local Plan, no map of anticipated density ranges is provided. No figures for expected densities are provided in the schedule of 35 specific site allocations in the document, even though these would be straightforward to calculate and to publish. This means that even those members of the public who take the trouble to read the main document and all its ‘supporting studies’ gains little idea of the reality of the building typologies and heights that will result from the policies in the OPDC Local Plan. alternatives, based on proportionate evidence. the National Planning Policy Framework and the supporting National Planning Practice Guidance. The Old Oak Neighbourhood Forum will be giving evidence at the hearings. See our post for March 2019 for more details. We will be arguing that the Draft Plan is neither sound nor justified, in important respects. The Consultation Statement and its set of Appendices, as prepared by OPDC officers, includes the representations made by the Forum at each of the three consultation stages, along with a response from OPDC planning officers.